Tom Smallwood worked in the corporate world for several years while dabbling with niche sites online. He finally took the plunge and quit his job recently to work online full time. He is currently scaling his own product business, as well as managing a few authority sites like MoneySoldiers.com. In this entrepreneur interview, Tom shares how he started earning an income through his finance blog and how he competes with others in the 'blogosphere'. He advocates that persistence is key, while injecting his personality is what sets him apart. For daily financial tips and a closer look at how Tom runs his business, be sure to follow Money Soldiers on Twitter! How did you get the idea for Money Soldiers? Is there something you wanted to do different or better than your competitors? I actually purchased Money Soldiers about a year ago. I have a background in finance and accounting and wanted to put some of my ideas on the web. But didn’t want to start with my own blog, so I purchased this site and made it my own. As far as being different and better, I think that's quite hard to do in the personal finance space. There are lots of really good blogs out there and I don’t know if I can compete at their level but I do have my own voice and way of explaining things that can add value and perspective to all readers. I picture growing it out with more of my own content and then trying to get some paid products up. For now, the blog earns mostly from advertisements but I would like to create my own digital product and promote it on the site. Also, I don’t have much of an email list so that's something that will definitely be on the to-do list. For the next five years, I see the site growing into a massive personal finance resource and helping people budget for their personal and entrepreneurial lives. What attitude/habits helped make you successful while starting Money Soldiers? Really just persistence. As I mentioned earlier, it's quite a competitive space but I just kept publishing and kept making contacts and getting links that eventually build up. As far as attitude goes, I think getting a mindset to actually publish often was something that helped me. It actually wasn’t on this site but another site I own where I started off with a fake persona and tried to build an audience that way. People called me out on it and I kind of got embarrassed by my lie. So I decided to start using my real name and background on all my sites. I think it’s much better and easier that way. Biggest milestone would have to be my first advertising client. They contacted me and asked to advertise on the site. I hadn’t even thought to do that before. It was crazy how much (I thought at the time) they offered me. I think just consistency was the main factor for getting there. What makes Money Soldiers unique from others? How did you find your competitive advantage? Well, I think its really just personality. No one can copy who you are. I feel like that has kind of been my theme here. I do actually somewhat keep up with the latest trends as far as SEO and link building goes but I don’t go crazy with it. I try to keep a good rhythm of outreach that generally does okay. So no real competitive advantage other than putting my personality in there a bit. This is tough. I really just try to organize my most important tasks at the beginning of the day to get them done, then push other more administrative type tasks to later. Usually, email and checking metrics is a later in the day kind of thing. My key motivator is really just my family. I have 2 sons that are both under 5 and I try to work to have a little extra money mostly for them. Well entrepreneurship I think is pretty common but working online still seems to be something that's difficult for people to understand. I usually tell people that I sell stuff online like an ecommerce store (I do actually have an ecommerce store but it doesn’t do very well). I think most people can wrap their head around selling stuff online but when I get into how adsense works or amazons affiliate program people seem to not care too much. In general, my relationships are about the same. Working at home has its difficulties with separating work and play. But often, I will go to a coffee shop and work to try and have a little separation. Who has been your greatest influencer along your entrepreneurial journey? How did they shape Money Soldiers? I haven’t really had an influencer for MoneySoldiers. Generally, I keep up with a couple personal finance blogs but haven’t really done much of that lately. I try to think of some original stuff and when I have an idea I make a post about it. What advice would you give to our readers who want to start a business in georgia? Where should they start? 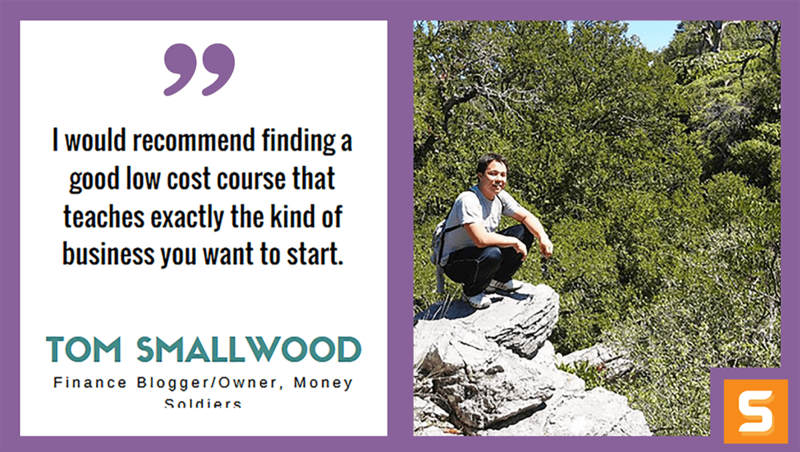 I would recommend finding a good low cost course that teaches exactly the kind of business you want to start. There are tons of resources online. Then once you are in the course, be sure to take advantage of the relationships you make with the other course members. Its really a lot easier when you have peers to talk about things with.